The Independent features an obituary of T. F. Torrance, who was undoubtedly the greatest British theologian of the 20th century. The obituarist David Fergusson rightly points to the immense contribution that Professor Torrance made to the dialogue between theology and science – or rather between the science of theology and the science of nature. Only in the English-speaking world do we find the ideological reductionism that cedes the natural sciences hegemony over the rational and critical investigation of reality and allows the likes of Richard Dawkins fraudulently to prosper. David Fergusson remarks on the conflict between Torrance and his colleague James Barr, citing Torrance’s stinging remark that “Barr had been a brilliant tailgunner in the RAF and had carried on shooting throughout his academic life.” At least Barr shot at moving targets. Dawkins prefers shooting fish in a barrel to taking on the great whales like Torrance who would have him for breakfast. 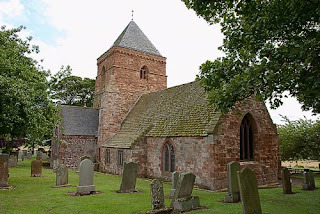 St Mary’s Parish Church Whitekirk, where Torrance was buried last week.